It will allow the guide, equipped with a microphone, to transmit all the information to the members of the group, endowed with personal receivers. The visitors can perfectly listen to the indications of the guide, particularly it results essential in the sites to elevated influx of visitors. IMPORTANT: When You get Your receiver, You will be asked a valid document of Yours (passport, identity card, driving license) or a bond of 10 €. At the end of the tour, when You deliver the radio, You receive Your document (or money) back. 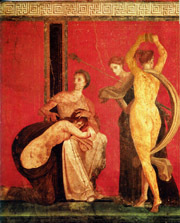 Pompeii is the classic goal of anyone who visits Naples. It is unique in the world, with its wealth of memories and sophisticated artistic products, the fascinating spectacle of its ruins both in the contrast of the red of its brickwork, the green of its cypresses and the white of its pavements, and in the new life that the ruins take on in the evening under the clever and fantastic lighting. The famous eruption of 79 AD (of which Pliny the Younger has left us a detailed and powerful description) cut off a whole city in the fullness of its sophisticated life, without giving the inhabitants time to escape. There were dogs tied by their chains and precious objects in the cupboards. Slaves and lords alike were overcome by the ashes and pumice stones in their vain flight. Certainly no archaeological find is more important than that of ancient Pompeii, where a culture was cuptured forever by the eruption of Mount Vesuvius in AD 79. Not only we can see the streets, buildings, furnishings, art, tools, jewellery, and even the food and drink of the people who lived here, but plaster casts reveal the people themselves. Meeting with the Tour Guide at 10,00 am near the ticket office of the Pompei Scavi Circumvesuviana train station, also known as the Villa dei Misteri station). You will deliver the voucher You bought for reserving the tour (3 €) and You pay on spot the other part of the total price of the tour (10 €): the cost per person is of 13 €. Then, You will have sufficient time for buying on Your own Your Pompeii entrance tickets (not included in the 13 Euros). We shall meet back by the Bar Sgambati and You can get Your personal radio (receiver) with earpieces: You'll be asked to deliver a valid document (e.g. identity card, driving licence, etc) or 10 € as bond and at the end of the tour You will receive the document or the money back. Thus, at 10,30 am the guided tour can start. THIS TOUR IS NOT PRIVATE AND WILL BE SHARED BY OTHER VISITORS ! 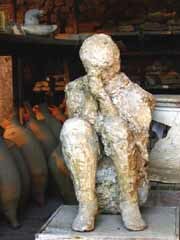 THIS POMPEII TOUR (WITH VILLA OF THE MISTERIES) LASTS 2 HOURS AND HALF AND IT COSTS 13 PER PERSON. IT IS CONDUCTED BY A PROFESSIONAL ENGLISH-SPEAKING GUIDE. THE ENTRANCE FEE IS NOT INCLUDED.